Last weekend, a friend of mine and I gave a house concert. For some, this may be nothing special. For us, it was momentous. For my friend, this was his litmus test. If people, especially his wife, found his concert to be a positive experience, he could do it again. For me, if people enjoyed my playing, I could dare to perform again. The experience was such a deep experience it can hardly be communicated, but I decided to try and make a sort of literary piece out of it. I turned it into a short story written in the third person, as though I were watching the character who decided to host this evening. And in a way, it was so. At times, it felt as though I were an observer in my own home at my own party. Even sitting at the piano, it sometimes felt as though I was an observer as well as participant. The story I have written has a feeling of abstractness, perhaps because I am unable to truly express such vivid feelings and impressions. Still, I hope some of you readers can be moved by it and find places in your hearts that are still frozen and lovingly thaw them out. Some people, as they age, appear old before their time, as though the wonder of life had been stuffed into a box, even while they were young. While still in their youth, they seem to have shoved their openness and dreams into a corner of their hearts. Their eyes sparkle no more, and only a faded dull gray haze of resignation remains. For others, life just gets used up, bit by bit, until they are worn out. Gradually, they grow old. It’s not that they’ve stuffed anything away, but the cares of life have worn them out. Life just slowly ebbs out of them until it’s all gone. Others become cynics. Cynics seem closed to deep human feeling. The effort to be above everything has made them half-dead. Other people become disappointed and disillusioned as life fails to fulfil their dreams, leaving them to appear worldly-wise and jaded. What remains is not wisdom, but rather calloused wounds. With the pianist, some of her youthfulness had gotten frozen. At different points in her past, she had unwittingly pushed parts of her personality into the freezer, where they remained until she dared to nudge them out, one at a time, and let them thaw. “You look so young!” people would exclaim, looking at her, as though they were paying her the highest compliment. “You haven’t aged at all!” Her youthful appearance was not only due to the freshness of her heart. Some parts hadn’t yet grown up. They were frozen, waiting to be given the chance to grow. But, I must also add, the parts of her that had grown up and matured were parts she lovingly cared for and nourished, so that the freshness remained. One day some time before, a friend of hers, a songwriter who played a mean guitar, had an idea. “Let’s do a house concert together at your house!” he said. 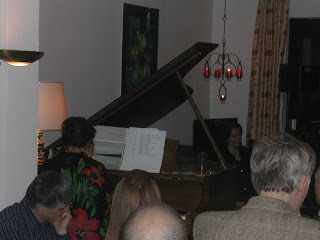 “Your living room is the ideal setting.” The pianist had been thinking for years about giving a concert in her home, but the courage for that endeavour had been one of the ice cubes locked away in her heart. This one had been there since she was about age ten. As children, her sister and she used to sing in harmony in the kitchen as they washed and dried the dishes. It was as natural to them as playing with dolls. So she asked her father one day if they could sing in church. A date was planned, they practiced a song, and on the day of the event the two little girls walked up to the front of the church to sing in front of a couple hundred people. The awareness that a crowd was listening just to them was too much for the girls, and in the middle of their song, one of them started to giggle. The other joined in, and all they could do was laugh, until the entire congregation joined them, first in isolated snickers, then in loud laughter, and it was not possible to sing anymore. Although they were the ones who started the laughter, for the two girls it was not funny at all. In the midst of the laughter, the girls ran off the stage, heads bent down in shame, rushing for the comfort of their parents. The pastor went to his podium and made some little joke about this hilarious song, and everything went back to normal. Except perhaps for the sister, and certainly for the pianist, who put her dream of performing in front of others into the freezer of her heart. She had performed since then. She had allowed some of that ice to partially thaw. She had opened up enough to agree to play the music other people chose, accompanying them on the piano or organ in church. That was fine, because no one was really listening to her. Sometimes, when they did listen, they didn't like what they heard, especially the mistakes. She had been told off more than once by perfectionistic pastors and competitive fellow musicians, and the ice started to form again. But there were enough good experiences, enough people who liked her music, to keep her playing. It was easiest when they didn't listen. The processionals were a bit tricky, because she then had the full attention of the congregation, unless they were chatting among themselves. But she usually found easy processionals to play on the organ, and they went pretty well. The recessionals were the most relaxing of all to play, because the people stood up to leave the church, and conversation drowned out the sound of the organ. Still, the idea of playing for people who weren’t listening was rather sad. It wasn’t really that wonderful to simply accompany others or play to chatting crowds, because she knew she was an artist, and artists need to have an audience. She knew she was an artist because her piano teacher had once told her so. And she knew it, deep down in her heart, even though she had tried her whole life to hide it or pretend that other parts of her were much more important. She looked at the attention other performers got, and began to find fault with them. What prima donnas they were! What narcissists, needing all that attention. She would never be that way. Better not to perform than to be a narcissist. Still, the dream of performing and not being laughed at was there, locked inside her heart. She couldn’t deny it. So she agreed to do the concert. Her living room was indeed the ideal setting. She and her husband were both artistically inclined, and between them, they had found, or been given, beautiful pieces of furniture and paintings. Another sister had painted exquisite landscapes from the region they had grown up in. There was lustrous teak furniture from Scandinavia, no longer in fashion, but still elegant. Persian rugs from the parents-in-law gave a feeling of old European culture. And there was the walnut grand piano her parents had bought for her when she was still a teenager and then shipped to her decades later. It was always a pleasure for the two of them to sit in their living room, even if it was only to watch the news on TV. Dinners on weekends were festive occasions with flowers, candles, beautiful tableware and delicious food. Theirs was a home made to share with others, and they often had dinner guests sharing the evening with them. But performing was something altogether different. On the morning of the performance, she noticed tightness in her chest. Her stomach was fluttering too, and thoughts hovered in her head - thoughts like, “What if I make a fool of myself and goof up all my pieces?” Or, “Perhaps my music is too plain. Or too difficult. Or too classical in style.” She did her best to release the thoughts to God, to enjoy the preparations for the party, and to enjoy the time spent practicing. And there were moments during the day when she enjoyed the feeling of her fingers flying precisely across the keyboard, creating beautiful flowing sounds. Other times they created lovely, rich harmonies as the fingers bent into the chords. Once, twice, five times correct, and she could leave the piece with some measure of confidence until the concert. She also paid some attention to these feelings. They were indeed strong. Yes, she was afraid of disappointing herself and her audience. She still remembered being laughed at, and the scolding and derision years later. She could still feel the shame. But were memories of shame and the fear of disappointment enough reason to not perform? No! She would do it, she would do her very best, and by God, she would enjoy herself! Her friend arrived and set up a monstrous concoction of cables, a loop system, loudspeakers, microphones, sound system, and pedals. All this for an acoustic guitar and voice. She listened to him practice. He sounded magnificent! The sounds his system made were like layers, forming a complex tapestry of rhythm and harmony. What if everybody found his music much better than her own? She told herself that her music was also beautiful. After all, she liked it. She had carefully chosen it. Each piece had a connection to a place she had lived in or that was important to her. Why shouldn’t people like both of their performances? There is room for all the music the world holds, and more, she told herself. Before the guests arrived, in a quiet moment, the two friends prayed for the evening, committing their trembling fingers, quaky voices, and all that would happen through them to God. The guests were seated. Twenty-nine people in her living room! The only place she could sit was on the piano bench, which seemed somehow fitting, since she’d be playing the piano soon anyway. It was nice to realize that she felt at home, sitting on a piano bench, even if performing from it was a bit frightening. She got up from her bench and walked to where her friend was sitting, joining him for a moment, as she greeted the guests. She felt nervous, but she smiled through her anxiety, as she welcomed the people, thanking them for coming. Some were friends of hers, others friends of his. They applauded. Twenty-nine people sat in the rows she had set up, and each one looked raptly at her friend, who was sitting on a stool at the door leading outside to the balcony. That corner of the room which was also her living room was now a stage. Every bit of her living room had become a concert hall. Later the stage would move to the grand piano, but for now, she could be part of the audience. She watched and listened as her friend started to play. She knew that he was as nervous as she, which was somehow comforting, since shared tension is halved tension. His nervousness didn’t show. Piece after piece flew by, each stirring up deep feelings inside her, feelings of longing, peace and recognition. She looked outside at the setting sun and saw the pink cherry blossoms darkening as the light lessened. The curtains her husband had ordered from England and she had sewn while the cherry tree was blossoming three years before, were shimmering golden in the evening light. Night gradually replaced day, as old age replaces youth. But it had its own beauty. 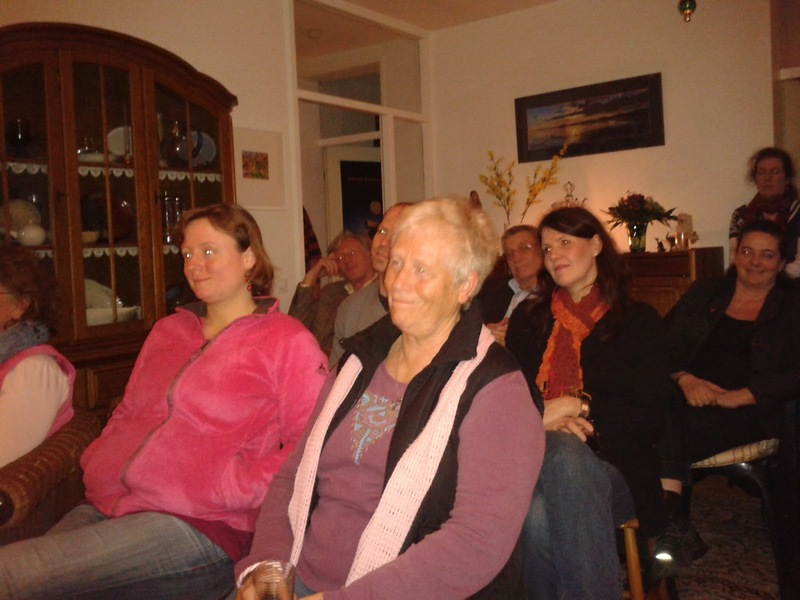 The energy of concentrated attention from the listeners seemed to create a physical glow to the room. The light, now provided by candlelight and electricity, remained golden. She looked over to a friend, who was listening intently with closed eyes. Another person was moving her head in unison in the same way as the pianist to the rhythm coming from the guitar and sound system. The room was in harmony with the music, with the listeners, with the friend. Harmony continued to warm the audience as they mingled, eating food and drinking drinks the two families had provided. The first half had gone very well, and the feeling of gratitude for her friend’s success was stronger than her fear of what might occur in her part of the performance. People throughout the room expressed amazement at the beautiful music they had just heard, and they were eager to hear more. The pianist sat again at the piano, this time to play. Her fingers tingled in a mixture of fear and anticipation, but they cooperated, measure for measure, crescendo after decrescendo. They paused at just the moments she willed them to. At times it felt as though her fingers were being played by something else. Could it be that Max Bruch, born in Cologne, was also in this Cologne living room, almost a hundred years after his death, helping her to play the piece he had written? It must have been so. She felt one with him, as well as oneness with those present. Was that Didier Squiban sitting over there by the door? She played the music of his Bretagne and her Cornwall, feeling herself and the listeners to be moving with the waves of the sea, as player and listener sat in the golden light of the living room. She played the same melody that had moved Ralph Vaughan Williams to write, mingling with him and Jesus, whom the melody was honoring. She sang her own songs, communicating to herself and her listeners a message she had once tried to impress upon herself. Truth, even that contained in poems we have written ourselves, sometimes takes its time until it becomes as true for the author as it is for the listener. This night, as she sang, her songs were true for her. In what seemed just a few minutes later, the concert was over. Waves of relief and joy washed over her and her songwriter friend as their tension uncoiled and they could finally relax. The living room was now a buzz of voices communicating. Simple conversations became exchanges of hope, healing and harmony. Their friends could not find enough praise for the evening – what a special atmosphere to have a concert in, how intimate, how beautiful. Someone told the pianist that she was a true artist, and she nodded. The truth was no longer a block of ice. Her friend told her that his wife loved her music, although she couldn’t relate to her own husband’s music. Each style had found its resonance, its own audience. Even though his wife couldn’t really connect with her husband’s music, she was glad to see that others could. For her, the evening was a success as well. For the musicians, the evening prepared the way for each of them to dare to perform again. The ice melted into rich, golden syrup, transforming the performance into a shared meal of communication through music, talk, and food.